The management of risk is a fundamental purpose of government. Whether risks arise from the physical environment, the economic environment, or even from changes in voter preferences, public institutions have a broad responsibility to assess and address the risks that impact the community they serve and their organisation. Public bodies are operating in a dynamic environment. The imposition of a Best Value regime is forcing them not only to perform more efficiently, effectively and responsively but also to develop best practices and benchmarking criteria to demonstrate their performance. At the same time, the ever-increasing delegation of responsibilities from central government and the European Union has widened their exposure to risk. Public institutions are now encouraged to partner with the private sector and outsource some of their traditionally retained services, generating agency and delegation exposures. In such an environment, controlling the cost of risk has become a real priority. But risk management is not just about preventing losses and reducing costs. Increasingly, risk management is defined as the co-ordinated management of all risks. This definition serves to encompass risk-taking where it serves to meet overall organisational objectives. This broader view of risk management, known as 'organisation risk management,' asserts that risk management is a general management function that permeates an organisation, is linked to the organisation's overall strategic plan, and serves to enable the operational achievement of organisational goals and objectives. Under this frame of reference, risk management is not something a risk management department practices on a public body; but rather an organisational value that informs and supports all managers' and employees' duties and activities. Risk management is a central purpose of public institutions. 'Public Sector Risk Management' addresses the major challenges facing public bodies today and provides the basic tools necessary for implementing a risk management programme. It introduces the subject of risk management through the development of a framework known as 'Organisation Risk Management' (ORM), which establishes the premise of risk management as an organisation-wide endeavour. Readers will learn of the governing concepts and principles of ORM in the public sector, but will also see how those concepts and principles translate into practice. Various ready-to-use tools and techniques are provided, which will enable readers to translate information into immediate use within their organisations. 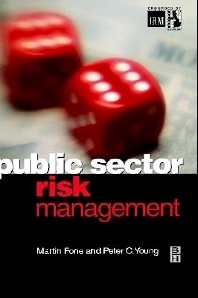 'Public Sector Risk Management' is ideal for practising risk managers, senior managers, and elected members desiring an accessible, but thorough, introduction to the subject . E.W. Blanch Sr Chair in Insurance, University of St Thomas Graduate School of Business, USA. Vice President of Munich-American RiskPartners.Pioneered the development of self-insured retention programmes for local authorities in the United Kingdom. "With additional input from Liz Taylor, chief executive of ALARM, it will be one of the recommended text books for the new syllabus in public sector risk management developed by ALARM and the Institute of Risk Management. Kevin McGlone, ALARM chairman, said "Our members are calling for education in risk management. We are developing a vocational route for training and accreditation. Passing this examination will be integral to development opportunities."